Lactobacillus rhamnosus HN001 (l. rhamnosus HN001) had a GRAS (generally recognized as safe) application filed to the US FDA by Fonterra for its use in infant formula in 2009. The strain, which was isolated from a cheddar cheese that has been consumed in New Zealand for more than 20 years, is known commercially as L. rhamnosus DR20 or simply DR20 from the New Zealand Dairy Board and as HOWARU Rhamnosus from Danisco. What is the Probiotic Potential of L. rhamnosus HN001? Like Lactobacillus rhamnosus GG, it is particularly effective in supporting immune function. For more information on the specifics of the probiotic L. rhamnosus HN001 strain, including details of what studies have shown, I will be publishing "The L. rhamnosus HN001 Guide." Where Can You Find Lactobacillus rhamnosus HN001? Lactobacillus rhamnosus HN001 is available in freeze-dried form. 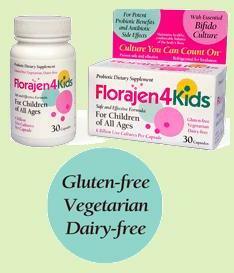 It is available in the US in Florajen 4 Kids and Blue Rock Holistics Super Shield. It is also available in the US and internationally in Metagenics UltraFlora Acute Care from my dispensary. Manufacturers change their ingredients frequently, so products containing this strain may change. The probiotic cheese that was used in the study mentioned above used to be available in Europe, but I have not located a current supplier as of the date this page was published. I suspect that the European Food Safety Authority’s rejection of some probiotic claims in food products, and the lack of consumer interest in previous years, may be to blame. I have contacted the manufacturer of this strain to find out where it is being sold worldwide. When (if) I hear back from them, I will post an update. Return to Lactobacillus rhamnosus page.